Now, not only did I not grab pictures of all my dishes but I didn't even snap a shot of my bunch devouring it all. I'll share the recipes anyways, as nothing failed me. My cornbread stuffing could have used a little less bread or a little more stock, but besides that, I was content. Add 1/2 cup of sugar and 1/2 cup of vegetable oil. Stir to combine. Scald the mix on medium hear(between 90 and 110 degrees, I used a candy thermometer to be sure). Add in 2 1/4 cups of flour and 1 packages of (2-1/4 teaspoons) of active dry yeast. Next, add another 2 cups of flour. Cover with a towel and leave someplace warm for an hour, it should double in size. When it had risen sufficiently add 1/4 more cup of flour, 1/2 heaping teaspoon of baking powder, 1/2 teaspoon of baking soda and about 1 tablespoons of salt. Stir or knead (eh?) just a little to combine. Oil or butter a muffin pan. Form the rolls by pinching off a walnut sized piece of dough and rolling it into a little ball. Repeat and tuck three balls of dough into each buttered muffin cup. Continue until pan is full. Cover and allow to rise for about 1 to 2 hours. Bake at 400F/200C until golden brown, about 20 minutes. handful of fresh thyme and sage. Prepare your turkey as usual, wash and pat dry. Place in a deep cooking try. Take your butter and smash down in the center. Add chopped garlic, thyme and sage. Knead butter together and separate into two small chunks and two large chunks. Shove two chunks under the skin of the thighs and smooth across the meat with your hand through the outside of the skin. Shove the other large chunks under each breast and smooth across. Quarter your onions and put inside the turkey cavity. Quarter your apples and place them skin side down in the cavity. Pour enough cider to fill the pan 1-2 inches full. I cover the turkey then for 3/4 of the cooking time with tin foil, and remove for the remaining time to brown. When turkey has been removed and has rested, take out your apples and remove the skin, and mash the apples for a quickie applesauce side :) You might want to roasted a few apples separately to add to this if you are feeding a lot of people. This was ridiculously delicious. I spread my sweet potatoes a bit more thinly in the pan and didn't pack the pecans on as tightly as she has (I wish I had taken a picture!) but this is recipe gold. This is going to remain a permanent Thanksgiving feature in our house! I think I'll make this again for Christmas, or at least, I'm pretty sure Cormac will want me making this again before next turkey day rolls around. Boil sweet potatoes (or steam) until tender, 10 minutes or so. Melt 1 stick of butter with the chopped sage in a small saucepan over medium heat. Simmer for 1 minute and remove from heat. Add butter mixture, milk, and maple syrup to the potatoes. From here decide what you want-- I didn't want two smooth mashes, so I used a hand masher and just slightly chunked the sweet potatoes together with the mixture. You can, alternatively, beat with a blender until smooth. Lightly toss pecans, butter and maple syrup on low heat in a saucepan, for a few minutes. Sprinkle the pecans over the top of the potatoes. Bake for 30-40 minutes or until pecans start to brown and edges bubble. This is my favorite stuffing. I made this two years ago as a test, and I'm so pleased. I really like my mother's stuffing, and she's made stuffing the same way since I was a child. However, I'm happy to say I've found my own way and this stuffing is MY stuffing. It's mouthwatering delicious and every day after you make it, it tastes better and better. 3-4 cups of stock (optional 1-2 tbsp white wine or 1 tbsp white wine vinegar)- I say 3-4 cups because sometimes I'll add more if I think I've got too much bread and not even wetness. Cube your corn bread and bread the night before and leave out to go a bit stale. This isn't totally necessary but makes the stuffing a bit more chunky. Saute celery and butter in pan, add in sausage and bacon if you choose. Mix all other ingredients, I whisk it all together. Add in your meat, celery and butter mix. Pour over your cubes in a large pan. Wider the pan, more yummy crispy bits on top, the deeper the pan, the more delicious soft fluffy stuffing. I like using this recipe because it doesn't have butter, and well, I'm adding a load of fat to my stuffing already. This cornbread doesn't need it! It's delicious on its own, and if you're buttermilk is low fat its a healthy cornbread recipe to accompany your southwest dishes, too. Preheat oven to 400F/200C and grease your 9x9 pan. Whisk eggs, buttermilk, sugar, and oil together. Mix in cornmeal, flour, baking powder and salt. This came about as a pleasant surprise after a bit slip up on the original recipe I found on a random food blog. The pie was my first bake of the day, and in typical Candi fashion, I made a silly mistake. As I was adding my spices, I picked up the jar of garlic powder instead of ginger (which look incredibly similar, ahem) and as I was dumping it into the mix I realized my mistake. So, halfway through the recipe I flubbed. Thankfully I hadn't wasted any pumpkin puree-- but I did wasted 8oz of cream cheese (the only 8oz I had), so I flipped open my BHG Old-Fashioned Home Baking for a basic pumpkin pie and combined the ideas. I will make this again and try to eliminate the can of condensed milk (probably through using yogurt or cream cheese as that was sort of the way my original recipe did it)... because it was only by strange chance I even had a can of condensed milk at home. Cormac actually said to me it was the best pie he'd ever tasted. We had vanilla ice cream and whipped cream to go on top. Real whipped cream. Although, the American in me bets this would be topped off perfectly with that fake-o Cool Whip. Using a food processor, turn your graham crackers or digestives (I used half and half because you can't buy graham crackers in Ireland, but I DID have half a box left over from my generous friend E) into crumbs. I usually add the sugar in at this stage to get it mixed well. You can go old school and put the crackers in a bag and hit it with a rolling pin, too. Slowly add your butter. I added a full cup, but I didn't measure my crumbs exactly so you may need less (you should need roughly 1 1/2 cup crumbs, but I like a thick crust so I probably used 2 cups). You want it to be wet enough that the crumbs are clumping together as you mix it. Grease 9 or 10 inch round pan (you can use a tart pan for the cool crinkle edges, or use a springform pan like I did for ease of removing it). Pour the crumbs in the pan evenly and pat it down until covered. I just sprinkle it in higher around the edge so I can create/pat the crumbs into a crust. Stick this in the oven for 8 - 10 minutes to prebake, just keep an eye at it towards the end that it doesn't overbrown or burn. When you take out the pie crust, pop the temp up to 375F/190C. In a bowl or mixer, combine your pumpkin, sugar and spices, mix well. Slowly pour in your can of condensed milk. Mix well. Pour mixture into your pre-baked shell (you can obviously use a regular pie crust or one of those store bought crusts if you want). Mix roughly 2 ounces cream cheese with 1 tbsp sour cream or yogurt (or if you have neither, thin it out a bit with just plain milk). With a tsp, plop dollops along the top of the pie. Mine sunk down a bit because I used real pumpkin puree which is a bit more watery (and I couldn't be bother to strain or cook it down too much) than canned. You can then take a knife or other sharp implement and swirl it around. I'm sure yours will look prettier than mine, but it all tastes equally delicious. So, I loved that bread so much I made it twice. The second time I used mini loaf pans (and if I do it again I'll cut the cook time by 10 minutes because they were a bit dry). 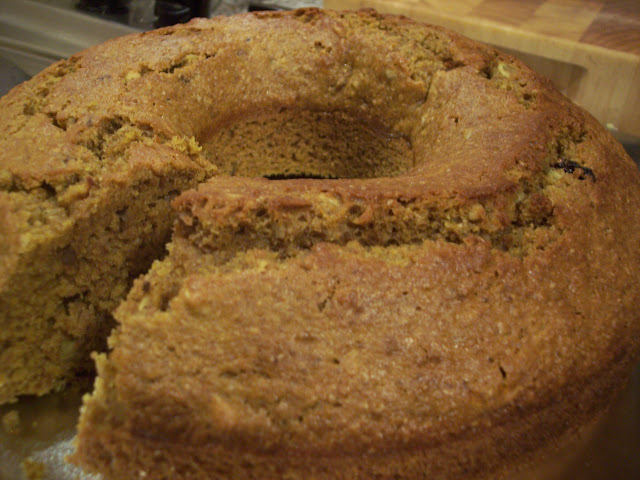 As a result, I got pumpkin-breaded-out and it was sitting in my cake box getting old. Inspiration struck-- I'll make bread pudding with it! And it was so delicious. I hate waste. Cormac loves a good pud or custard, so between the two of us and my little monster we nearly finished it off that evening! Break/cut your bread into cubes and lay in an ungreased 9x9 pan. In another bowl, whip together your eggs, milk, vanilla and spices. Pour the egg mixture over your bread cubes. Bake at 350F/180C for 40-45 minutes. I wish I had a picture but, it didn't last long enough. Eat it straight out of the oven on a cold night for best taste-- with some custard poured over it, yumyum! I love this time of year, excuse to use loads of pumpkin. That is, in my case, butternut squash, since I'm a big cheat. However, I still believe firmly that it tastes nicer than pumpkin. This makes 1 ring of bread (bundt pan) or two loaves. In a mixing bowl (or the bowl of your mixer) mixed half the flour (1/2 cup WW flour, 1/2 cup AP flour), baking soda, baking powder, salt, and spices. Add pumpkin, milk, eggs, vanilla and shortening. Use mixer and beat 30 seconds to mix and a couple minutes on high. Bake for 1 hour for a ring mold/bundt like I used, or 45 minutes for two loaf pans. You can make a glaze with a bit of powdered sugar and water, and a hint of cinnamon and nutmeg, or just do what I plan to do, which is slice it up and smear it with butter or cream cheese. I plan on making french toast with a few slices for my breakfast, yum! Firstly, I have to apologize. I haven't posted anything in a long time-- but I'll admit, I've been busy baking up a new baby girl. We welcome Harper Jamie into the world Halloween 2009 :) at our own home (I had a planned home birth). I'll resist the urge to spam this blog with pictures of my beautiful baby girl (and her big sister of course). Now, to the good stuff that you all actually care about-- baked goods! These are everything that ginger cookies should be -- soft, chewy, cracked, spicy... and delicious with a hot cuppa. Not the best picture I've ever taken, but I'm pretty sure you can see that delicious combination of sugars crystallized on the outside of that perfectly cracked cookie. These taste of Christmas. And, here in Ireland, the weather has turned and now we face 6 months or so of cold, wet weather. To beat this, I need delicious, soul warming food to keep my spirits up. 1/4 cup shortening (you can omit this and use 1/4 cup butter (thats 1/2 cups total) instead, but they just don't crack as well. Preheat your oven to 175C/350F-- I think this is really important for these cookies. Cream together butter (and shortening) and sugar. Add in molasses, honey, vanilla, and egg(s). Beat until creamy. Sift together flour, baking soda, spices, and salt. Add flour to butter mixture, slowly. Roll your dough into 1 inch sized balls, and then roll them in your bowl of mixed sugars. Place on greased baking sheet (I use some baking/parchment paper). Bake for 10 minutes, then keep an eye on them. I like soft and chewy cookies, so I take them out at 10 minutes. If you leave them in a few extra minutes they will likely go crunchy-- I always do half of them a little over cooked because Cormac likes crunchy cookies (bah!). Let the cool on the sheet for a few minutes before moving to a cooling rack. As always, shove several in your mouth and enjoy. These are particular good with a cup of coffee. nom nom. You can get about 3 dozen cookies out of this recipe.